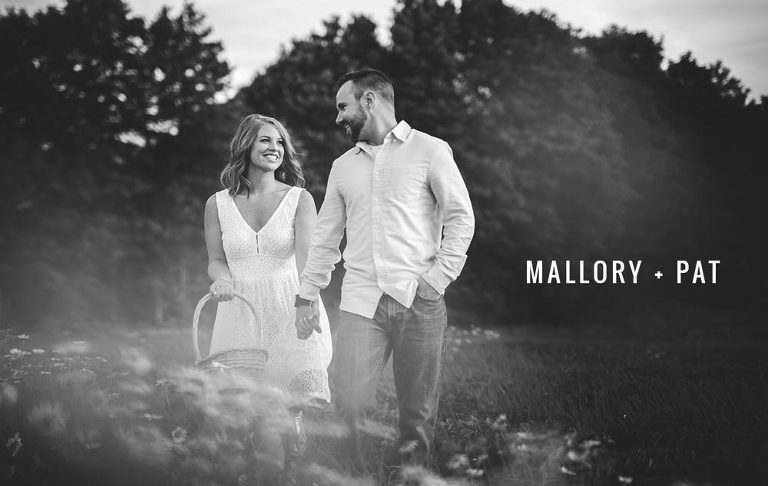 Orillia’s hidden gem and one of the top wedding venues in Muskoka, Northbrook Farm played host to a unique adventure for Mallory, Pat and myself – a styled engagement session. A week or so before their scheduled engagement shoot I was speaking with Katelyn at Astilbe Boutique and the opportunity for a styled shoot was bandied about. EDIT FROM THE FUTURE: Check out photos from their Holland Marsh Wineries wedding. With a tiny window of opportunity just a week away, we went to work contacting other local wedding vendors we admired. We reached out to Laurie at Northbrook Farm as well as Ego’s Strawberry Farm to host, Jordan Ashley MUP to glam Mallory up, of course my wonderful intern Abby and Sweetened by Kagi to create the icing on the strawberry themed cake. In just a few short days we had ourselves an all-star backed engagement session – all in record time! We had both been working at Zellers in Kingston. I was a cashier and Pat was loss prevention (security). I had noticed him around the store and had a big crush, fast forward a few months and we ran into each other at a bar downtown Kingston called Stages. We got to chatting and exchanged phone numbers. He messaged me a few days later on Facebook and I quickly learned that he also had a crush on me from seeing me at St. Lawrence, the college we both attended and was excited when he saw I worked at Zellers. Mallory: We went to a movie, it was a scary movie “The Strangers” and I remember saying something like “I may need to hold your hand or squeeze your arm”, and Pat took my hand before the movie even started and held it right till the end. Pat: I can remember the walk to the movie theatre in downtown Kingston. As we were walking together, it didn’t feel like a first date whatsoever. Mal eased my nerves and next thing I knew we were holding hands and you might say the rest is history! Mallory: After I graduated from school I moved home to live with my parents in Georgetown, three hours from Kingston and Pat. Pat and I had to do long distance and it was heartbreaking. We did long distance for about three years and it never seemed like we would meet in the same place. We would see each other maybe every two weeks and spend hours on the phone. People would always say “I could never do long distance” but I knew there was no one else I wanted to spend my time with or talk to so it was worth every second, and look where we are now! Pat: I remember once Mal finished school (in Kingston) and we were packing up her apartment for her to move back to Georgetown when she half jokingly said “don’t forget about me”. Three years of long distance, two living with her parents, our first house (and our dog Romeo), all seems to lead back to that moment. Mallory: It was the week after my birthday and Pat had planned a “date day”. He does this regularly so I didn’t think anything out of the ordinary, and have been hoping for the past 6 years that a “date day” would end in a proposal… I should have known though because he was acting a little weird but I didn’t put it together until after. We went to the Scenic Caves in Collingwood and were hiking the trails. It was really quiet because it was the first week back to school and when we got down to the caves we were the only ones there. We were taking pictures and I was ready to keep moving on our hike but Pat kept lingering. Looking at different parts of the caves (trying to find “the” spot) finally he pulled me close and told me he had something for me. I was thinking “oh my gosh, this is it” and he started reading me a note he had prepared, eventually getting down on one knee! I couldn’t believe it was finally happening and obviously said yes! We spent the rest of the day at Scandinave Spa relaxing in the hammocks and reminiscing on the morning and our last 8 years together! Pat: We took a road trip to Collingwood at the beginning of September. This time of the year is much less busy than the regular tourist crowds. We began the day with a hike through the trails on our way to the Scenic Caves. The air was warm but once we got down to the caves it was cool and we found ourselves the only ones down there. I was beyond nervous and probably acting weird but eventually got the courage to get down on one knee. It was a whirlwind moment that now seems like a blur! Luckily she said yes and we were able to spend the afternoon at the Scandinave Spa! Mallory: That he puts up with my craziness and sometimes joins in! The first time we hung out I basically interviewed him with a microphone while playing Singstar, even my best friend thought “well, if he doesn’t run after that, I approve”. He lets me listen to Christmas music in July and was thrilled when I got us a second tree (okay, maybe a stretch). He can be so goofy but keeps me grounded and doesn’t get mad when I put his stuff “away” and can’t find it! Pat: Her positive outlook on life. No matter what the situation is, Mal has a way of finding the good and bringing out the best in everything she does and everyone she comes in contact with. Her sense of humour is pretty awesome too! Mallory: The first look! I can’t wait to see how Pat reacts when he first sees me in my dress! I also can’t wait until I walk down the aisle and see him standing at the end! I still can’t believe this day has come! Pat: Also looking forward to the first look. At first we were both a bit skeptical but after some consideration we both are excited and more than comfortable to start our day with that private first few moments together.